MATTHEW KIRKPATRICK is the author of the story collection Light without Heat and the novella The Exiles. 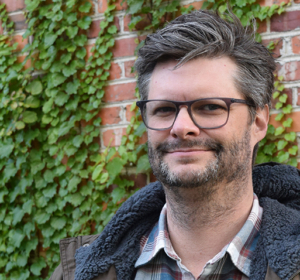 His writing has appeared in many literary journals, including The Rumpus, The Believer Logger, The Common, Puerto del Sol, Web Conjunctions, Western Humanities Review, Diagram, The Notre Dame Review, Unsaid, Five Chapters, and Denver Quarterly. He earned his PhD at the University of Utah and is Associate Professor of Creative Writing at Eastern Michigan University. A strange museum, an even stranger curator, the deceased artist who haunts him, and the mystery surrounding the disappearance of the museum founders’ child . . . 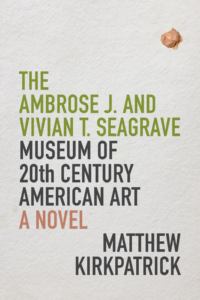 The Ambrose J. and Vivian T. Seagrave Museum of 20th Century American Art is by turns a dark comedy, a ghost story, a romance, a whodunit, a family saga, and an exhibition catalog. Through museum exhibit labels, as well as the musings of an elderly visitor wandering the galleries of this legendarily odd institution, the novel’s numerous dramas gradually unfold. We learn of the powerful Seagrave family’s loss of their daughter, of the suspicious circumstances surrounding her disappearance from their yacht during a violent storm, and of the motley group of artists (some accomplished, some atrocious) who frequented the Seagrave estate, producing eclectic bodies of work that betray the artists’ own obsessions, losses, and peculiarities. We learn about the curator’s rise to power, his love affair with a deeply troubled ghost—and when a first-time visitor to the museum discovers unexpected connections between the works on exhibit and her painful past, we are plunged into a meditation on the nature of perception, fabrication, memory, and time. Tell others about The Ambrose J. and Vivian T. Seagrave Museum of 20th Century Art. Choose Your Platform!